If you've watched the Confederations Cup, you have no doubt been annoyed by the mysterious buzzing sound that drowns out even the TV announcers. Well, get used to it, because that sound will haunt you throughout next year's World Cup. 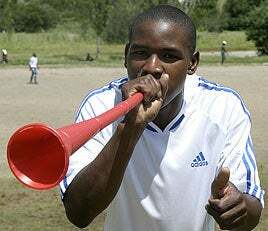 The sound is from the vuvuzela, South Africa's answer to the Thunderstick. By itself, it's just a small plastic trumpet that probably cost less than a dollar to make and creates no known musical notes. But when thousands of people toot them simultaneously, you get a loud, incessant hum that makes the entire stadium sound like it's being attacked by angry bees. It's a staple at any South African soccer match and ... surprise! Everyone hates it! FIFA president Sepp Blatter revealed this week that broadcasters want the instrument banned at next year's World Cup. But to his eternal credit, the Fifa chief also sprang to the defence of the humble trumpet, saying people must accept that it is part and parcel of football in South Africa. "That is what African and South Africa football is all about - noise, excitement, dancing, shouting and enjoyment," said the most powerful man in world football. European fans, both at the tournament and at home, have been complaining about the non-stop trumpeting from the riff raff in the upper deck. Even some of the players would like to see a ban on the plastic toys that stadiums give out for free. (They can't concentrate!) Fortunately, there's very little racial or political tension between the Dark Continent and its former European oppressors, so I'm sure that when millions of Northern Hemisphere-type folks flood the country next summer for the biggest sporting event in history they will be totally tolerant of this charming, yet insanely annoying, local custom. Why can't South Africans enjoy soccer like normal folks—with racist songs and flare guns!